Perhaps I’m getting ahead of myself here, considering that we’re only a few days into spring, but I can’t help but already celebrate asparagus season. I’ve had a fascination with asparagus since first discovering this green beauty upon moving to the States. Asparagus feels memorable every time it ends up on my plate. Despite its year long availability, it is a pricier vegetable and I reserve it for special meals. But in spring, when the farmers markets explode with the green spears, I take full advantage and gorge on it. 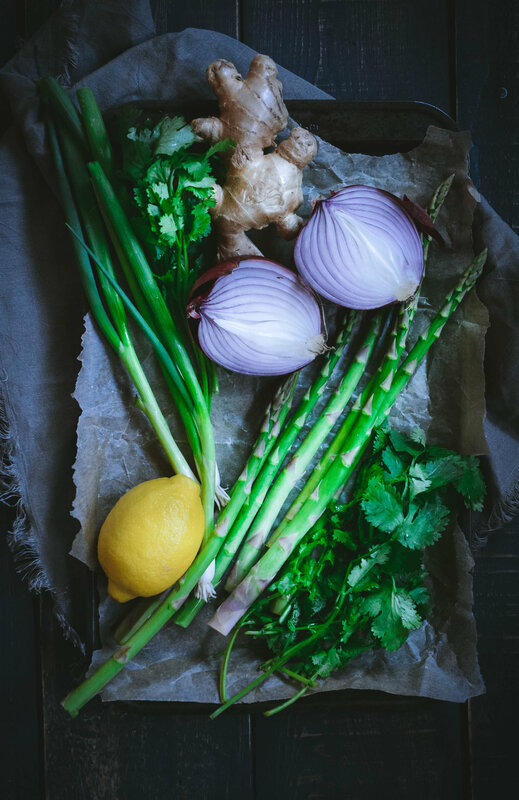 Even though asparagus at first glance seems robust and sturdy, it can easily be wrecked in the cooking process. It needs to merely kiss the heat for a few minutes in order to come into its full, glorious potential. I guess I never really thought about vegetables making out with heat but okay…I guess this is where we are now. But let’s get back to today’s recipe. I wanted a versatile enough dish that could easily make for a simple breakfast lunch or dinner. I also wanted it allergy friendly and first and foremost, tasty, with earthy yet bright flavors to celebrate all that spring has to offer. 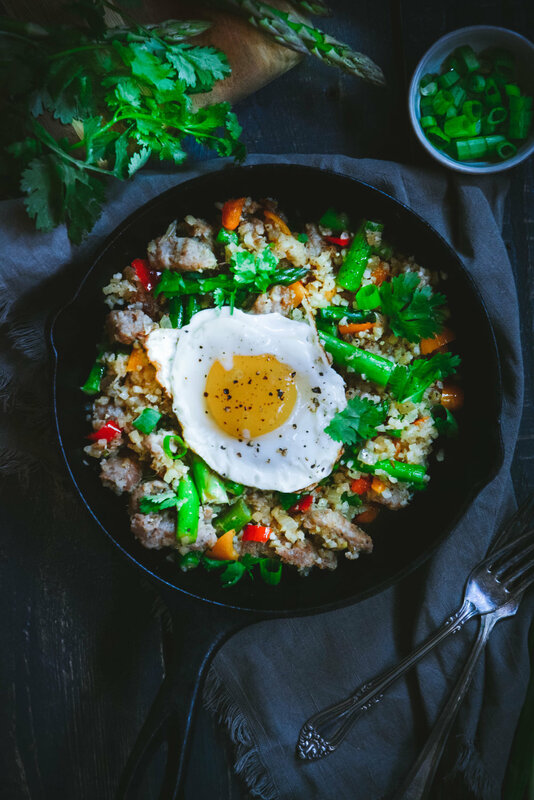 Red onion and sausage create a flavorful base and are tossed with cauliflower rice, sweet bell pepper and asparagus. Ginger and coconut aminos, add depth and the whole thing is finished with some bright lemon zest. Now, you could certainly stop there, but if you want to take it a step further, you could add an an over-easy egg and take this dish to another level. Heat cast iron skilled over medium heat. Add oil and sausage. Cook sausage breaking it up with a wooden spoon until it’s cooked through - about 10 minutes. Remove sausage and set aside. In the same pan, if needed, add a little more oil, onion and a pinch of salt. Cook onion stirring regularly for 5 minutes until translucent. Add bell pepper and asparagus and cook for another 5 minutes until vegetables have softened a little. Return sausage to pan, add cauliflower rice, sausage, grated ginger, coconut aminos, salt, pepper and lemon zest. Cook for 5 more minutes, stirring occasionally, until all ingredients have combined. In a separate pan, cook eggs to your preference and serve along with asparagus scramble. Optional, top with green onion and serve right away. Hi! I'm Daniela. Thank you for stopping by. I created this site to provide you with information and recipes on how to live well without gluten and dairy. Calm Eats focuses on intuitive eating, paleo recipes that are easy on the gut as well as health and wellness articles to improve your every day. Get to know me better here. © CALM EATS 2017. ALL RIGHTS RESERVED. Unless otherwise stated, all images are original. Please be sure to link back to calm eats if using any images.